Home Tags Posts tagged with "baggy pants beer thief"
Baggy pants clumsy beer-thief was arrested in Polk County, Florida. Woman hunted by police for ATM stiletto heel attack. A saggy-pants clumsy beer-thief, accused of stealing beer from a Polk County convenience store earlier this year, was arrested on Wednesday, August 24. Juan Luis Gutierrez was charged with petty theft and booked into the Polk County Jail, Florida, after he was identified based on convenience store surveillance system recordings. Juan Luis Gutierrez, 27, tripped on his baggy pants while trying to steal beer earlier this year. Saggy pants clumsy beer-thief was arrested in Polk County, Florida. Polk County police said Juan Luis Gutierrez from Lake Wales, tried to steal two 18-packs of Bud Light from the E-Z Food Store, 15 Acuff Road in Lake Wales, on April 27. 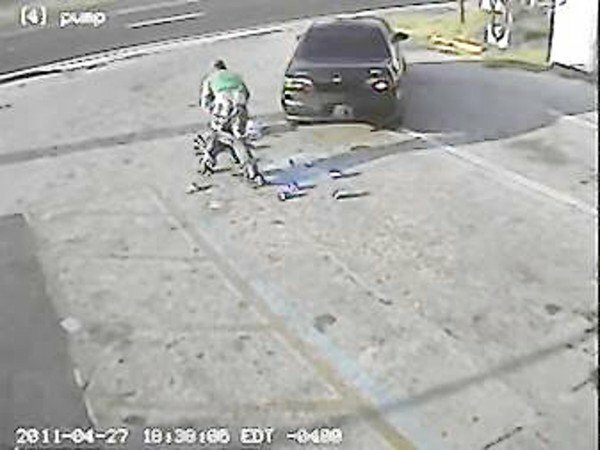 As thief Juan Luis Gutierrez ran toward the get-away car, he tripped on his baggy pants and fell, and dropped the beer. The driver was later identified as Angel Miguel Ortiz, 22, who was arrested on August 18 and charged with one count of petty theft. He has since bonded out of jail. Polk County police said saggy-pants Gutierrez admitted to the incident.